There is no doubt that William Bottrell of St Levan had relatives who were engaged in both piracy and smuggling, and he relates a number of stories about pirates and smugglers in his three volumes. Many people think that these relate to events in the 15th and 16th centuries as it is generally not known that in the eighteenth and early nineteenth centuries the fast sailing Cornish luggers were very profitably employed, during peace time in smuggling. However, at the end of the 18th century the Government had put a lot of effort into bringing the trade to an end. Many of the Sennen smugglers had fled to the Channel Isles in order to escape prosecution amongst them some of Bottrell's relatives. In 1803, the forces of the Crown were once again involved in fighting the Napoleonic War. 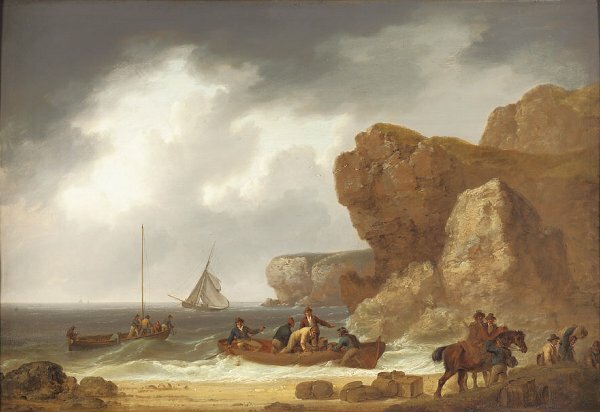 This meant that the Smugglers of Cornwall took on a new lease of life. One might even say that the Government was in some measure responsible for stimulating it. For in the early months of the war, owing to the need of men for the services and home defense, Royal Proclamation was made that any smuggler who had fled the country should, provided he was not charged with murder, be permitted to return without fear of arrest, on his entering into bond to refrain from smuggling practices for the future. Copies of this proclamation were posted in all Cornish villages, and it was not long before the news filtered through to those who were lying in exile overseas. Among the first to take advantage of the amnesty was a certain Christopher Pollard, of Madron. The latter had been charged some 9 years before with obstructing and assaulting the revenue officers, and had fled to Guernsey in order to escape the consequences of his crimes. He now returned to Cornwall and signed the requisite bond, Robert Parsons of Madron standing surety for the sum of £200. But for him, as for many another, the allurements of the old adventurous life were too strong, and little more than six months had elapsed before Pollard, as appears from a brief to counsel, dated 1805, was again concerned in a charge of smuggling. The prosecution states that on this occasion the accused had assaulted the officers of H.M. excise when occupied in their duty at Sennen, and had incited a crowd of three or four hundred persons to attack the excisemen with a view to carrying off the smuggled goods which they had captured and were defending on the beach. This landing was indeed a valuable one, consisting as it did of one thousand gallons of brandy, one thousand gallons of rum, one thousand gallons of Geneva, and five hundred pounds of tobacco. In addition to the general charge of inciting the mob, Pollard was accused of having offered £100 for the rescue of a hundred ankers of the spirits and ‘of using other violent and improper language’. The counsel for the defense admitted that Pollard was part-owner of these goods, but stated that what had actually happened was that on going to Sennen he had found the cargo in the possession of the revenue authorities, and that so far from inciting the mob to a rescue he had gone straight home, only calling in on the excise officer at Newlyn in order to advise him to go to Sennen at once ‘lest any unforeseen circumstances might ensue’. It further appears that in the evening of the same day on which the cargo had been landed, Pollard was in a public-house at Penzance trying to sell a yoke of oxen to a farmer of Nancothnan, named Pool. The latter afterwards accompanied Pollard to Sennen and agreed to provide him with horses wherewith to remove the cargo in return for the promise of a cask of brandy for his own use— ‘he having a number of workmen and tradesmen about him at the time’. On arriving at the beach, however, about eleven o’clock at night and finding a huge crowd firing muskets and throwing stones at the excisemen, ‘they decided that that was no place for them to stay for that they would be killed’. So both returned home. In a district in which almost every inhabitant had probably had some hand in smuggling at one time or another, the presence of such a malicious and wholly un­scrupulous informer caused widespread fear, and no doubt accounted for the difficulty which was experienced in obtaining witnesses for the defence. On this occasion the jury chose not to believe her evidence and Pollard was found not guilty and allowed to go free. The above is the story as told by Hamilton Jenkin but how much of it is provable some 200 years later. The George brothers lived in Sennen Cove. The story goes that the first two, Joseph and John George, the eldest members of the GEORGE family, were concerned in a smuggling venture with the owner of the inn, one Dionysius Williams. Joseph and his wife Ann GEORGE ran the inn and refused to pay the rent to their landlord, as they had something on him. ie they had smuggled his goods. Her husband, Joseph George, had been his agent. Dionysius eventually threw them out for non-payment of rent and Ann George, in a fit of rage, turned King's Evidence and shopped Dionysius to the Revenue Men. circa 1804. In another legal brief in 1805, where she again turns King's Evidence, a Christopher Pollard is accused of running a valuable, cargo into Sennen. Ann George is the principal witness for the prosecution. The brief describes her former 'evidence' against Dionysius Williams and the council attempts to discredit her, by recounting her notorious character and her past record. As well as the above case the defence quotes another case, in which she quarrelled with her brother in law, John GEORGE over some tobacco deal and had shopped him to the authorities, accusing him of firing on a revenue officer. She is supposed to have so incriminated him that the "poor wretch was actually convicted and hanged on 5 June 1802" A K Hamilton Jenkin in 'Cornwall and its People' goes on to say that "no less than 5 people have been capitally indicted by her means, one of whom had already been executed" [her brother- in law- John George] Probably due to her evidence being so discredited, Pollard was acquitted. I have NOT seen the 'briefs to solicitors' mentioned myself but I have seen the talk that was given by Mr Bridger to the Old Cornwall Soc. in the 1950's, where he describes the foregoing but, said Dionysius Williams was found not guilty. His talk was written up in one of the 'Old Cornwall' publications and in the local press at the time. I would have been very surprised if any jury had convicted him, let alone one composed entirely of his peers. His grandfather, also a Dionysius Williams, was an eminent mathematician and astrologer, and had married into the family that owned the Manor of Maen/Mayon [the Tremewans.] Dionysius Williams III, although base born, had inherited the Manor under the Will of his natural father Dionysius Williams II. He thus owned considerable property in Sennen, including the Cove. He was to die, with no direct male heirs, in early 1830. NICHOLAS.Rebecca's father was a Mathew NICHOLAS and from this date on there were boys named Mathew in the GEORGE family. As well as these brothers John & Joseph & Mathew [and a Richard, of which no further trace other than baptism can be found] there were Peter, Henry and James. As you can see the NICHOLAS family name figures often. His father had married in 1773 ,not to Margaret, but to his first cousin Ann TREMEWAN and had 3 daughters. When Dion. WILLIAMS II died in 1799, his illegitimate son inherited under his natural father's will. On an old map of Norden's it is called "The Ship" inn. This map was surveyed in the 1600's but not published until the end of the 1700's - hence the anomaly in the names of landlords not being those current at the time of publication. Sometime in late 1800's the name was changed to the "Old Success" after the seine net company of that name. It was painted by the artist Farquhar, who lived in his studio in one of the net lofts near the inn. There is also another family by the name of GEORGE in Sennen. and this has led to confusion as to which of the two Sennen inns was the home of Joseph and Ann George. The VINGOE family owned and ran the FIRST & LAST INN in Churchtown. They also owned much else in Trevescan, Trevilley and Escalls and the Land's End piece itself . Some of this confusion comes from the fact that an Eleanor Vingoe married a John George in 1761 and a Sarah Vingoe in 1786 also married a John George, however this is another group of the GEORGE family, distantly related to the 'Covers' of the same name. A study of the Sennen parish registers shows that there is a tangle of George, Vingoe, and Nicholas names and they intermarried frequently to consolidate the land interests. The names Vingoe and Nicholas were in Sennen at the time of the 1642 Protestation return but I believe the George family came in from St Levan / St Buryan sometime after the Civil War. As regards John GEORGE, allegedly shopped by Ann GEORGE for shooting a Revenue Man, I have not found this execution carried out at Bodmin on the date mentioned. I have a list of Bodmin Trials and there was a John George, age 30 who was tried and executed at Newgate in 1808 for smuggling. It is possible those writing the story got their facts muddled somewhat. If the John George above IS the one who marries the widow Grace Penrose on 19 Oct of 1802 he cannot be the one allegedly hung in June of the same year.Many smugglers had their sentence commuted to either transportation or service in HM Ships of War, especially at this time when we were at war with France. I can find no further trace of John George or his wife Grace in Sennen.